A new global project is working on five continents to improve how we can predict the impacts of climate change on agriculture: The Agricultural Model Intercomparison and Improvement Project. From warmer temperatures to natural disasters such as flooding and drought, changing patterns of climate are having billion-dollar impacts on our food-growing systems. But scientists are struggling to find ways to measure and predict what may happen in the future—and to translate that into policies to help feed a bulging world population. 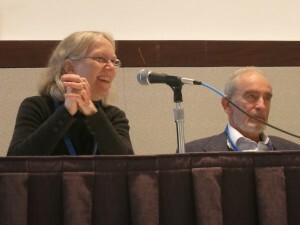 Cynthia Rosenzweig of the Goddard Institute for Space Studies and Paul R. Ehrlich from Stanford University answer questions at a panel on climate and food security held at the 2013 annual meeting of the American Association for the Advancement of Science. 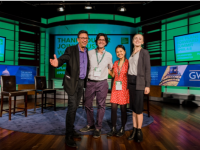 She spoke Friday at a panel on food security at the annual meeting of the American Association for the Advancement of Science in Boston. Also on the panel were Thomas R. Karl of the National Oceanic And Atmospheric Administration’s National Climatic Data Center, Paul R. Ehrlich of Stanford University, and Felix Kogan of NOAA. Rosenzweig detailed a new effort to mesh climate science, agricultural expertise and economics to help make better forecasts, titled the Agricultural Model Intercomparison and Improvement Project—“AgMIP.” The multi-disciplinary effort involves scientists, economists and food experts on five continents. That climate change already is affecting food systems is not in question. 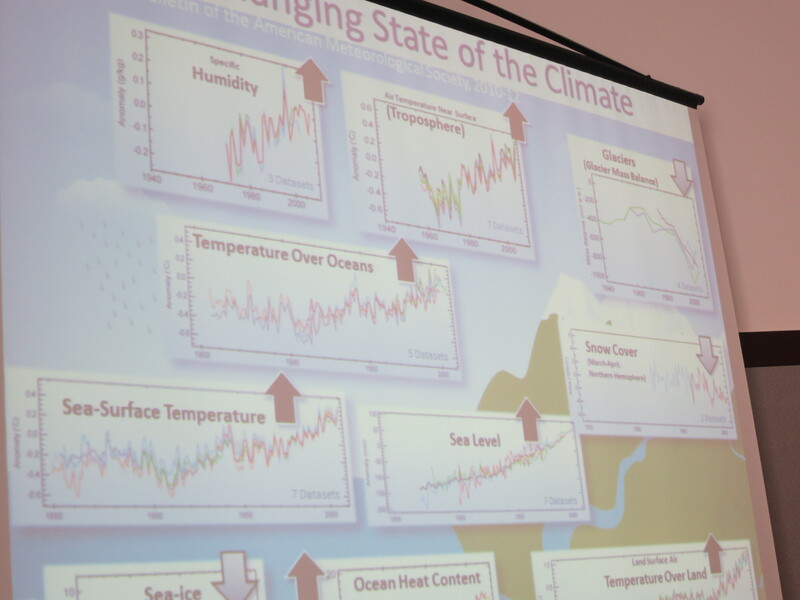 “You have a very consistent picture of change,” said Karl, displaying a slide full of fever-line charts showing various measures for climate: temperature, humidity, land and sea surface temperatures, sea level, ocean heat content—all rising; glaciers, snow cover, sea ice—all down. 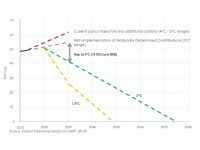 From many angles, the climate trend is clear. The changes tied to global warming have led to a dramatic increase in the chances of extreme weather and climate events, said Thomas R. Karl of NOAA. Projections from the UN’s Intergovernmental Panel on Climate Change show the earth’s relatively wet regions growing wetter, and the dry regions becoming drier as a result of the dynamics of climate change. The panel’s newest assessment, due out in stages, from September 2013 to April 2014, will reinforce those predictions. An increasing number of “billion-dollar” natural disasters have struck in the period since 1980, Karl noted: hurricanes and tropical storms, droughts and heat waves, flooding, severe local storms and tornadoes, winter storms and crop freezes, wildfires. Many billions of those dollars represent losses in crops, crop insurance payments and related agricultural costs. Experts already use various kinds of data and models to try to determine what will happen to agriculture under different environmental and economic conditions. But the data may be collected in different ways, the models use different protocols, and the results don’t always line up. That makes it difficult to create a more regional or global perspective, and to understand how climate change will affect agriculture. The AgMIP group Rosenzweig is working with, formed in 2010, is trying to better calibrate and improve crop prediction models. And they will start using several climate models to assess the impacts of climate changes on agriculture. The group has set up “sentinel sites” around the world—tracking production of wheat, rice, corn and other foodstuffs in ways that can establish best practices for gathering and analyzing data. 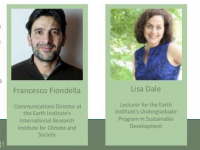 It’s a huge project: The group has identified dozens of sites on five continents, and will utilize the skills of teams of specialists in economics, agriculture, climate and information technology. They’re also looking at soils, water resources, livestock and grasslands, and perhaps eventually pests and diseases. The group has spent two years designing research protocols, setting up teams around the globe and completing initial assessments and pilot studies. Their work will be introduced in the journal Agricultural and Forest Meteorology on March 15, Rosenzweig said. 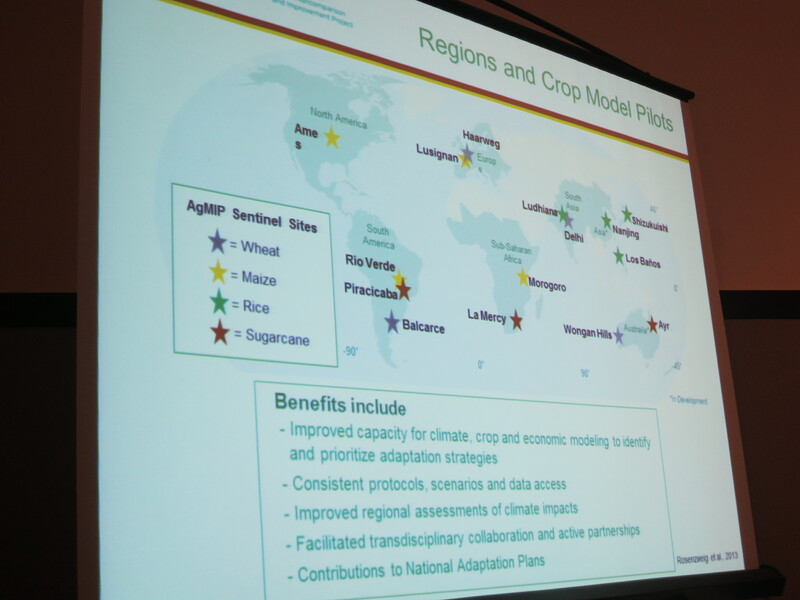 Pilot projects already underway are looking at future impacts of climate change on wheat, rice and maize. Pilots for sugarcane, sorghum, millet, soybean, peanut, potato and others are in development. Along with Rosenzweig, the project’s co-leaders are James Jones, senior research scientist at the University of Florida, Gainesville; and Jerry Hatfield, lab director at the USDA-Agricultural Research Service in Ames, Iowa.